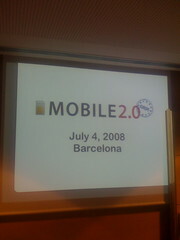 Today is a Mobile Day in Barcelona…but for once not for Mobile World Congress (3GSM new name), but for a cousin event to the one organised in San Francisco: Mobile 2.0! People are all in there, starting from Daniel Appelquist from Vodafone or Peter Versterbracka one of the founder of Mobile Monday Global community). Discussions form opening panel were interesting, “Mobile Social Media”, where it’s not sure than every panelist agrees, but billing point came quickly as a key issue in this topic! You can read from this conference also from a Mobile Veteran Fred Dumeny.